Know your grow. Anytime. Anywhere. The smart grow room monitor. Satisfaction guaranteed. 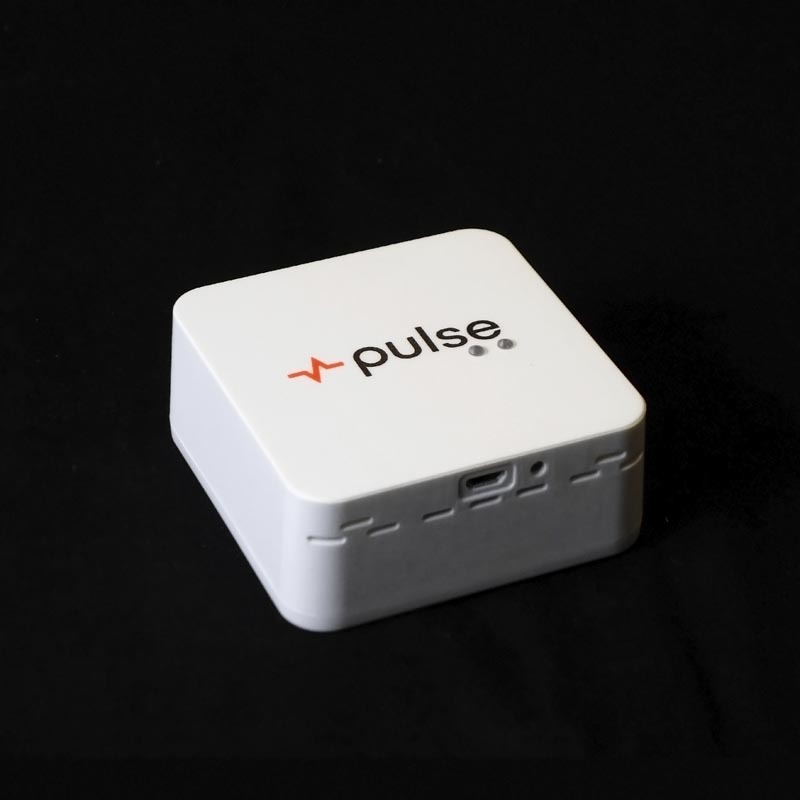 You have 30 days to try Pulse and return it if you are not completely satisfied. Get help buying. Chat now or call 1‑888‑53‑PULSE. 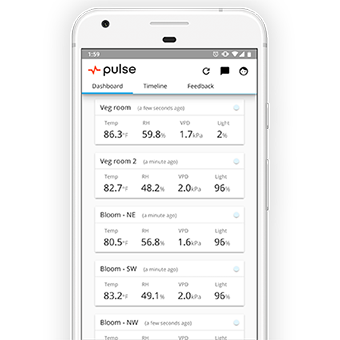 You place the Pulse One in your grow room, connect it to your WiFi, and you will always know what's going on with your room's environment. 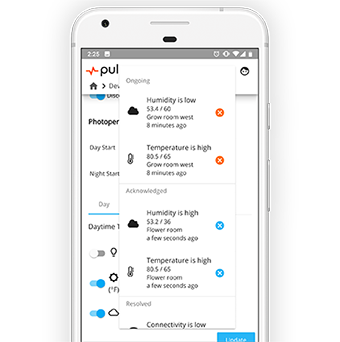 Pulse is an IoT device with an associated app that lets you monitor your grow's environment remotely. 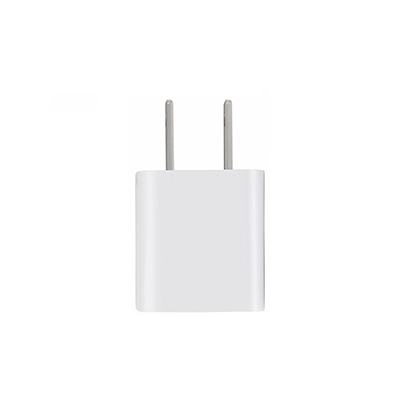 The Pulse One device is designed and assembled in the USA. The Pulse App is developed in California. Pulse measures temperature, humidity, light, and VPD (vapor pressure deficit). What is required to use Pulse? 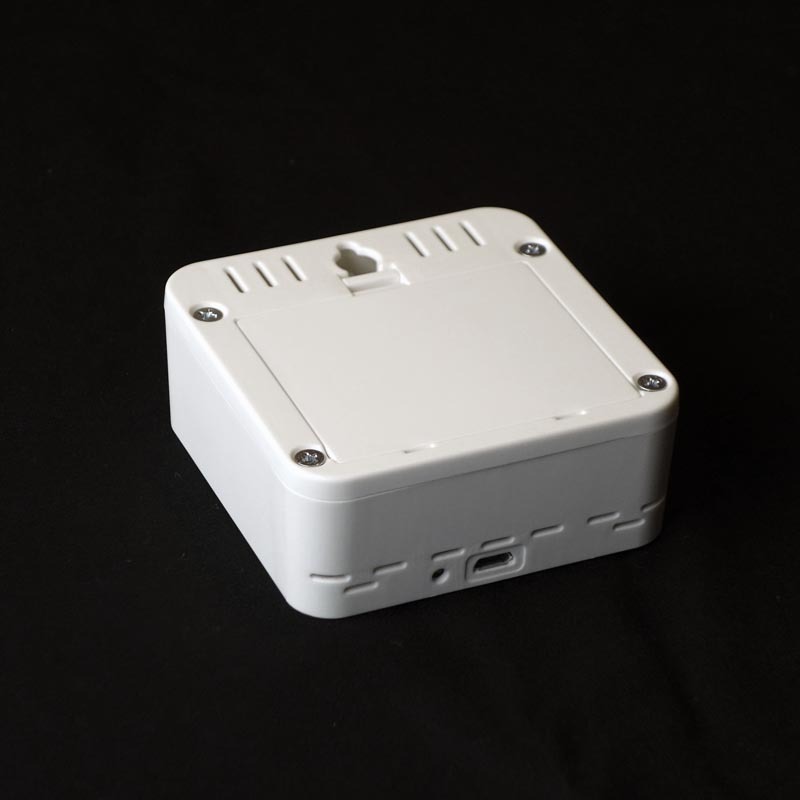 You just need the Pulse device, WiFi in your grow room, and an internet connected device or computer. You need 802.11b/g/n WiFi (2.4 GHz) with WEP, WPA or WPA2 security. How reliable is the Pulse platform? The Pulse infrastructure has been built using the industry leading IoT platform with top reliablity, security and performance considerations. Yes. Pulse follows industry-best security standards and practices – from authentication to encryption. Can I buy a wholesale package? For wholesale inquiries, please contact sales@getpulse.co to reach our head of sales. © 2018 PULSE LABS, INC.